Half fill a clean vase with luke warm water. Using a sharp knife or scissors trim 2 - 3 cms (about an inch) from the end of the stems at a 45 degree angle and arrange your flowers in the vase. Position your flowers out of direct sunlight, and away from heating or cooling vents, draughts, and ripening fruit. 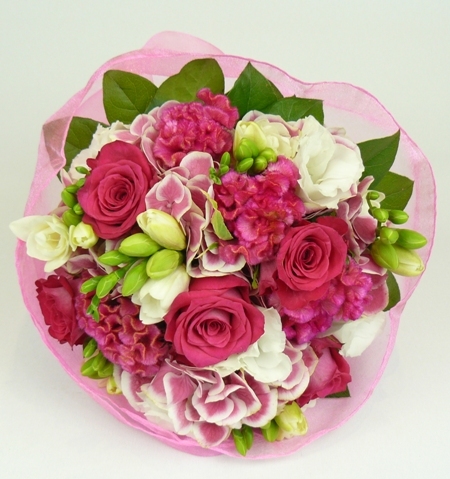 Flowers in floral foam or water filled box: check water level daily and top up if necessary. Roses, hydrangeas, chrysanthemums and other 'woody stemmed' flowers: If these flowers begin to droop, recut them as in step 3 above and place the stems into a container of very hot water for about a minute before transferring them to a vase of luke warm water. This will normally revive these blooms for another 2 to 3 days.